Don't struggle with other tools that force you to scrub for hours, and save your toothbrush for the job it was made for. When you switch to this powerful alternative, you'll never worry about dirty grout lines again. 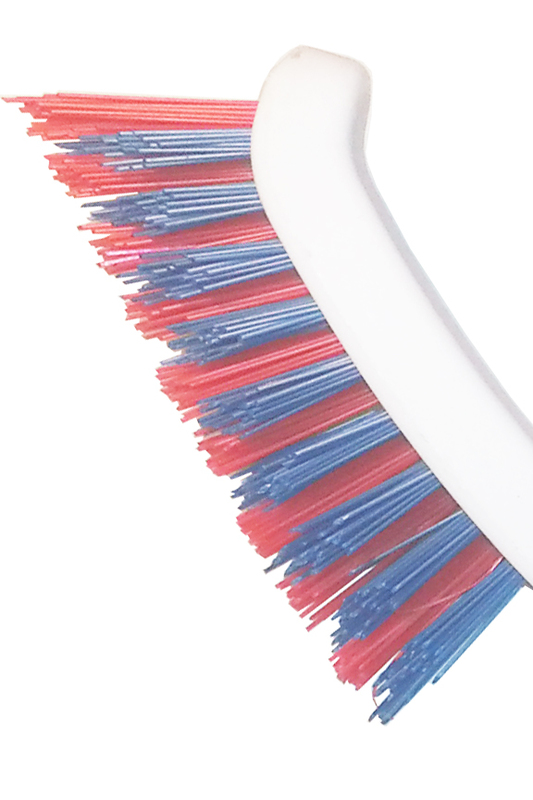 It has durable bristles that can scrub loose any type of dirt, and they won't lose shape, turn soft, or wear flat like cheaper versions do. Instead of scrubbing and sweating like other tools demand, you will gently move back and forth as the bristles do all of the work for you. The advanced material cuts through scum, eliminates grime, and lifts up stubborn dirt without effort. Because the head is tapered at the center, it allows you to clean thin or thick lines without any change, and you'll wash the top of each tile, and the grooves, with the same simple motion. A slight point at the front makes it ideal for tight corners and other hard to reach spots, and ensures that no area is impossible to clean. The comfortable handle has been given the perfect angle to make it easy to use, and it even has a hole at the end so you can hang it for storage. Throw out those flimsy brushes, inadequate scrub pads, and toxic cleaners. With this amazing tool at your disposal, you won't need to block the fumes, or collect your sweat because any surface in your kitchen or bathroom will be easy to clean. Professional Quality. Other tools wear out after a single use, or never get the job done. This one guarantees a clean surface, and the power it delivers will last for use after use. Advanced Bristles. There's more of them when compared to the competition, and the work way better too. Other tools have soft materials that bend, brake or wear down. 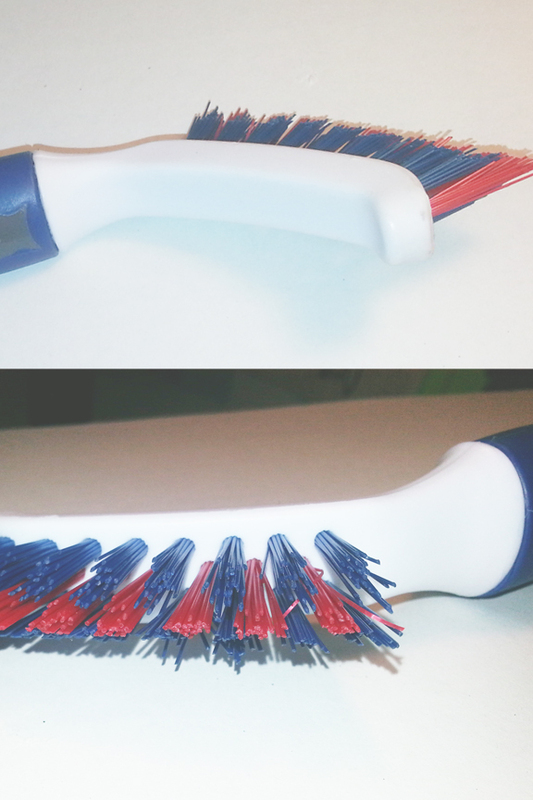 The tough bristles on this tool give you more scrubbing power, and they will work like new time and time again. Compatible. Some brushes are only designed to clean one size of grout line. This one works with thin or thick grooves, and it will even scrub tile on the surface, all at the same time. Safe for use with any type of tile. Advanced Design. The handle is angled for ease of use, and it scoops up at the end to provide the perfect spot to rest your thumb, and apply pressure when needed. A triangular shape on the head allows you to wash more surface in less time. Pointed End. Most brushes are aligned straight up and down. This one has an outward angle at the tip to make it easy to clean all the way to the edge, deep into corners, and inside any tight areas. Powerful. Why settle for a tool that forces you to use way more energy? This one does most of the work for you, so the toughest grime is still easy to remove. Looking for something bigger? Want one that attaches to a pole? We do carry larger models that have the same type of bristles, and they will help you cover more area in less time. This hand brush is perfect for small surfaces, or tight corners, but for floors and tubs, you may prefer the shark or the demon pro because they are bigger. Like the small size, but prefer something a little more advanced? 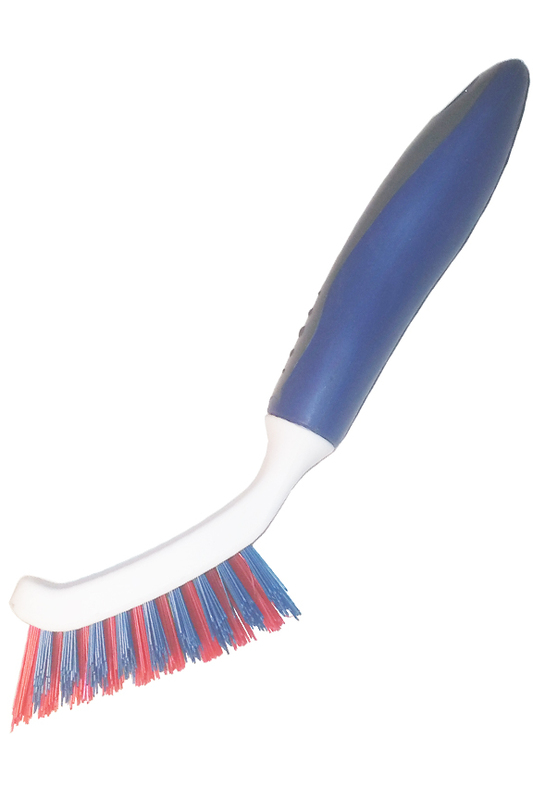 Take a look at our deluxe hand held grout brush. It's similar to the one featured here, but it has a curving head, and larger size that may make cleaning easier. Use less energy, and do a better job. Other brushes utilize inferior materials, so they don't work as well, and you have to replace them sooner. With this one, you don't have to scrub like a maniac, and working with it is simple, but follow the steps below to ensure proper function and safety while maximizing it's potential. Always use hand-held. Grip with your strong hand at the dark blue handle. If increased pressure or scrubbing power is required, slide your hand down, and position your thumb onto the white scoop at the front. Use on compatible surfaces only. Check the list that follows. You may be used to weaker tools, but this one is truly powerful, so it can leave marks on softer materials. To prep the surface, get it wet. Add a small amount of cleaning solution if desired. Soap and cleansers are not necessary because the brush alone cleans like crazy. To clean, align the center row of bristles with the grout line being scrubbed. Press down to touch, then apply slight pressure as you move up and down, or back and forth. Continue with this motion until the area is clean. The brush will wash the top surface of tile, and the grout, all at the same time. When finished, rinse the surface to remove any left over soap, or loose debris. When finished, rinse the bristles thoroughly, then hang up to store for later use. The bristles on this thing are no joke. They'll definitely deliver unmatched cleaning power, but they will also scratch softer materials if you're not careful. This brush is totally safe for use on any tiled surface, but when using it elsewhere, make sure to stick to the materials listed below, or ones that are similar. You would never think to use a regular tool without some sort of dangerous cleaner, but this one is different. It actually cleans so well, that you can do the job with water alone, and you can certainly use something a little more safe than your off-the-shelf bathroom cleanser. You will have great results no matter what soap you decide to use, but if you would like to keep the toxic substances in the cupboard, try the recipe below for an eco-friendly way to clean your tile. If you would prefer a safe option that you don't have to mix yourself, check out our natural shower cleaner. It's totally safe, but incredibly powerful, and when combined with this tool, no dirt will be stand in your way. Fill a small bucket or sink with hot water. Add 1/4 cup of vinegar. Mix in 1/3 cup of lemon juice. Pour in 1/2 cup of baking soda and let fizzle until settled. Add this mixture to a spray bottle, or apply directly to the surface. Stop replacing brushes every time you clean, and don't waste effort by using something that just doesn't work. You can definitely find a less expensive grout brush, but you would quickly realize why it has a lower price tag. This one will deliver guaranteed results, and it won't fall apart or go limp after you use it. Skip the soft, thin, or weak alternatives, and go with something that has been proven to remove the toughest grime from any type of tile. Because it's built with commercial grade materials, you know it will last a long time, and allow you to get your tub, shower, counter or floor tile cleaner than ever. Dimensions 9" x 2.75" x 1.25"
Bristle Fill 50% more than other tools. Bristle Angle 31 degrees at the tip. Allows you to clean tile and grout at once. End Bristles Pointed outward to clean up to the edge, and into tight areas. Comfort Grip Yes. Coated handle for increased comfort. Angled Handle Yes. Apply pressure easily, and scrub without effort. Uses Scrub and clean small areas of tile, or areas that are difficult with other tools. Easily clean into corners, and quickly remove any type of dirt. Clean the lines and the tile next to it with one motion. A professional level tool, priced for the home user. Don't settle for inferior products that wear out, or leave behind grime. Choose this one to save time and reduce effort while getting your tiled surface cleaner than ever. Order Yours Today! This and the recipe on your site worked very well. It wasn't easy, but effective. My light colored grout looks almost new now. Better than an old toothbrush for sure!!! You can use this on everything! Yep you can clean tile and grout with it but this thing cleans everything!!! What a great little tool..
Love this brush! perfect for cleaning grout lines in corners and tight spots. I also Love the full size SHARK grout brush for large areas.